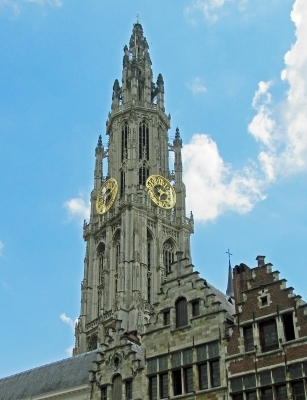 The Belfries of Belgium and France are 56 bell-towers, built between the 11th and 20th centuries. They are mostly found in town centers, and connected to the local town hall or church. At their time, the Belfries represented the growing importance of cities instead of the feudal system in the Middle Ages. After several fires, stone began to be used as building material instead of wood. Mainly square, robust towers were built in this period. Later, from the 14th to the 17th century when most of the still remaining belfries were built, the towers lose their defensive character. They become narrower, and the styles are influenced by Baroque. In the 19th and 20th centuries, newly created belfries had a more symbolic value of independence and prosperity. Of the numerous belfries in Belgium, I first visited the one in Lier. Lier is a picturesque small town near Antwerp. It also has an old Beguinage, part of another worldheritage. The tower in Lier distinguishes itself because of the 4 little towers. It's situated at a typical Flemish square, where a market for pigeon enthousiasts was going on when I was there. 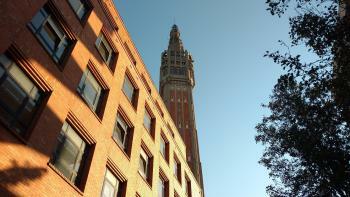 The belfry in Leuven, another nice Flemish town, I visited four years later. It's part of St. Peter's church. This tower has a quite unusual shape because it was left unfinished. My first French belfry I saw in Amiens. I had expected Amiens to be a lot more like those Belgian towns, but there isn't much left of its medieval history besides the city's two highlights: the Cathedral and this belfry. The belfry in Gent was the first one that I climbed. Its stairs are narrow and winding, so it is not for all. I met an English speaking tourist on the way up, who had left his wife behind downstairs. It does reward one with a magnificent view of the skyline of Gent. I visited during the festivities of its 700th birthday (1313-2013). The circuit let us also into the quarters of the St. Michaels guild (now a fencing club) in the Cloth Hall that is build against the belfry. With a good zoom lens you can also see the 4 guard statues that are placed on the corners of the belfry. My visits to Flanders (Brussels and Brugge in 2016; Antwerp, Mechelen, and Ghent in 2018) were also visits to some spectacular towers called the Belfries. Many of the towers I saw are attached to other huge structures. Many of them support the carillon bells, which are played every hour providing a soundscape that brings everyone back in time. I learned from my arts studies class back in college that etymologically, belfries have nothing to do with bells. The word is derived from the Medieval French word berfrei that literally means tower in a fortress (or a castle). Sometimes, it is used to denote the high watchtower of a fortification of the Medieval era. Today, belfry is used to refer to Gothic, Medieval and early Renaissance architecture dominant in Belgium and Northern France. They were once upon a time symbols of power and influence. 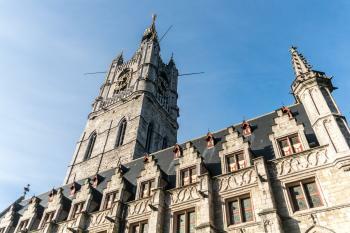 Many of them were extensions of Medieval cathedrals such as the belfry in Mechelen (attached to St. Rumbold’s Cathedral), in Ghent (attached to St. Bava’s Cathedral) and in Antwerp (attached to the Cathedral of our Lady). 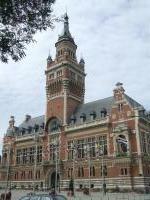 Some are the primary motifs of town or city halls (as in Mechelen, Antwerp, and Brussels). It makes sense that these towers are adjacent to churches and city halls because the Medieval era is the era of the Church’s authority. Once upon a time, the city halls were even owned by the Church. During my travels to Flanders, I was able to explore the following belfries designated as WHS: The Belfry of Brugge (Brugge); The Belfry of St. Bava’s Cathedral (Ghent); The Belfry of Antwerp City Hall (Antwerp); The Belfry of the Cathedral of our Lady (Antwerp); The Belfry of St. Rumbold’s Cathedral (Mechelen); and The Belfry of Mechelen’s City Hall (Mechelen). The Belfry of Brussel’s City Hall is also worth mentioning here because it is also a WHS. However, its inclusion is not within the designation of The Belfries of Belgium and France but as part of La Grand-Place, Brussels. 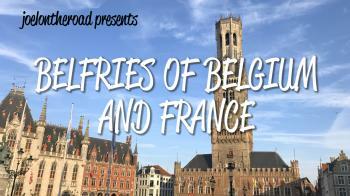 I have yet to see other belfries – in Leuven, in other Flemish cities, in Wallonia and even in France. For more commentaries on the belfries of Belgium and France, please click here. With the wars that have been fought over Belgium and France, I am amazed that so many belfries are still standing or have been rebuilt. The Ypres Cloth Hall bell tower was one of those reconstructed after World War I, and I visited the tower as part of a visit to the In Flanders Field museum last month. The tower was rather plain, but it offered great views of the town and countryside. There was also an exhibit on the historical cat festival, during which a cat (thankfully now a stuffed animal) is tossed from the top of the tower for good fortune. From Ypres I continued to Bruges, and its bell tower, standing tall over the market square, was more impressive. It also afforded excellent views of the city environs. I visited two more belfries in Antwerp. The tower on the Antwerp town hall was covered in scaffolding, and did not seem particularly memorable, but the belfry on the Cathedral of Our Lady was exquisite. 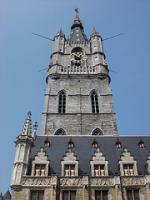 Unfortunately, it did not appear that tours were available for this tallest church tower in Belgium. I still am not certain why so many belfries in Belgium and France needed to be inscribed for this World Heritage Site -- it seems rather excessive. That said, I had a great time hunting for the towers with friends while in Belgium. Logistics: These belfries are in major cities, and are accessible by train. Many other sites would seem to require either private transportation or advanced planning for public transportation. So many belfries! My wife and I visited Belgium in August 2017, and decided to see a representative sample of the belfries on the list. In the end we saw two cathedral belfries (in Antwerp and Leuwen), a town hall belfry (Antwerp), two marketplace belfries (Bruges and Ypres), and two standalone belfries (Tournai and Mons). Of these, I think Antwerp cathedral, Bruges and Tournai are the most impressive mainly due to their height and imposition on the surrounding area. And if you're going to climb one, don't make it the one in Bruges! It's 10 euros, while climbing in Tournai is 2 euros. See below for my full Youtube review. Read more from Joel Baldwin here. I fondly remember a comment made by Ian in his review of Telc: In a country that has plenty of pretty town squares this one has to take the prize for the prettiest.. Those words rang very true at the time as I stood on the Telc town square and accompanied me along my travels in Czechia. These words echoed again in my mind as I visited a few more of the Belfries on a short weekend trip to Belgium and Northern France. But... Instead of inscribing a representative subset of Belfries - let alone the single best one - it feels like the Belgian and French authorities went the opposite way: Put each and every Belfry on the list that there is. This includes rather simple examples such as the one in Kortrijk. Or very modern structures - looking at you, Lille - that are more of an architectural quote than an original Belfry. You also find reconstructions such as the one in Arras which was destroyed during World War 1. Finally, multiple places are WHS on their own or closely tied to one (Brugges, Tournai). Still, I had a very pleasant time seeing yet more Belfries. 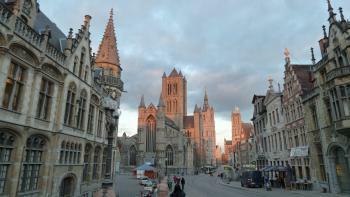 Flanders is a blessed area of the world rich in culture and history. Drop me off in any Belgian city and I will enjoy myself. But this also holds true for most Czech cities of which not every one boasts a WHS market square. In the end, as much as I enjoyed the scavanger hunt, I feel the Czech approach is the proper one for WHS. If I had to pick the best site, I would probably say Antwerp. In the end it's not really about the Belfries themselves, but what else the city has to offer. And Antwerp as a city is a clear favorite of mine. It also seems to be the city with the most inscribed locations for Belfries. Antwerp: Plantin Moretus, Le Corbusier. You may also venture North to see the Van Nelle Factory or Kinderdijk, the quintessential Dutch wind mill site. Arras: Vauban, Nord-Pas de Calais Mining (Lens). It also hosts one of the WWI cementeries. Mons: Spiennes, Wallonia Mining Sites, Four Lifts. And yet another WWI site, but a special one seeing it's a German-English site. Brugges: City itself and a Beguinage. Of the sites I have seen, I would single out Lille as being a terrible first visit. My parents went, couldn't find it at first, couldn't believe they had actually found it and then had good laugh. I get their point. It's fairly modern and not part of the old town. It is amusing to see, though, when you have seen some of the more classical ones before. Personally, I still want to visit Gent. And having passed the city quite a few times by train, each time thinking how great the Belfry looks, I also want to see Mechelen. Belgium and Northern France are blessed with splendid public transport options, most of these listed in google maps. The distances aren't that great either, so happy hunting. I've visited several of the belfry sites from 2009 to 2017. Each of the various belfries is usually the tallest structure in each town, built for defensive and civic purposes. Contrary to what most people might think, the belfries were mostly secular, with only a few of the structures being associated with churches. Visiting any of the individual belfries isn't that hard, as it is just a matter of going to the particular town where the belfry is located. Getting to all 55 would just be a matter of determination. 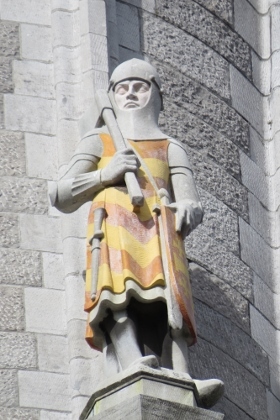 Read more on my website about the Belfries of Belgium and France. I have studied in the Lille area and I spent a lot of time traveling throughout French and Belgian countrysides. So far, I have seen 55 of the belfries. The most amazing ones were Ypres, Gand, Tournai, Bruges, Aalst, Arras, Armentières, Mons, Béthune, Douai, Calais and Rue. This has to be one of the easiest WHS to tick off your list if you only intend to view one or a few of the 33 Belgian sites + 23 French sites in this entry. However, it is quite a task to visit all of them since they are scattered all over both countries. I have visited 16 sites in total (14 in Belgium and 2 in France) and climbed most of the belfries where this was possible. 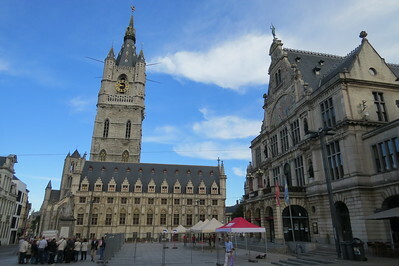 My favourite one is that of Tournai, adorning the square below and the cathedral nearby (another WHS), closely followed by the belfries of Antwerp and Bruges for their architectural beauty and importance. My wife, Barbara and I were guests of Eddy Baeyens (of Buggenhout) in November of 2011. Eddy and I were schoolmates from Xaverius College (Borgerhout) in 65-66. Eddy had arranged for us to climb to the top of the Stadhuis Belfry in Dendermonde and to be given a hands on explanation of the Carillon and even a brief, unscheduled concert by the Carillon Master, Marc Van Boven. I was also given the opportunity to play a little tune on the Carillon myself! It was a very long 160 step trip to the top of the Belfry where the 49 bells are, even above the clock. There was just enough room for the three of us. A wonderful experience! Lier - a white tower with steeple, attached to the town hall. Formerly known as the Belfries of Flanders and Wallonia and now called the Belfries of Belgium and France after 23 such buildings in the north of France were added to the 33 already on the List from Belgium, these make an easy site to visit, since you can go to almost any town in Belgium or northern France and see a belfry there that's probably on the List. Generally speaking, a belfry is a symbol of a city's freedom from some outside overlord (as opposed to a castle - symbol of the feudal lords - and a belltower - symbol of the church) and later came to signify a city's wealth and prosperity. The ones I have seen are the ones in Ghent (a huge building that used to function as a fortified watchtower, also the only one I have seen from the inside - there are lots of stairs and a lift to take you to the top to enjoy a great view over the city), Bruges (a symbol of the city known the world over, as evidenced by the Longfellow poem The Belfry of Bruges; by law, no building in the city may be higher than the belfry), Lier (attached to the Town Hall), Leuven (part of St. Peter's Church, but not well visible), the 2 in Antwerp (cathedral and town hall), the 2 in Mechelen (also cathedral - very impressive - and town hall - the belfry forms the middle part of the building and is quite low), and the one in Amiens in France (quite nice, but nothing outstanding). I visited the town of Brugge in summer 2004 as I had to take a train from there back home so that I could subscribe for university just in time. I've been on vacation in northern France, directly behind the Belgian boarder and so used around six hours to visit this town. The Belfry of Brugge is really beautiful and it definately dominates the market square. I sat in a café at the market and had a lovely view to this amazing building which is really worth a visit. The beautiful belfry in Mons (Hainaut) is the only Baroque one in Belgium and symbolic of the city. It is located in the highest part of the town, built as the name Mons suggests, on a hill. The youth hostel is right next door. Mons is in the industrial Borinage region of Southwest Belgium and often overlooked in favour of the showcase cities of Flanders. There are, however more world heritage sites or parts of world heritage sites in Hainaut province (4) than in any other in Belgium. I have now seen many of the Belfries inscribed, 15 I think. Perhaps the most impressive is the Belfry of Onze Lieve Vrowkathedraal in Antwerpen (pictured) which contains four major paintings by Rubens and is well worth a visit, it shares a square with the Stadhuis which is also inscribed. In the rest of Flanders, the one in Mechelen is massive, the one in Brugge seems to be too big for the area it inhabits, Gent has a very interesting one with statues of the former guards on it, and the one in Leuven is odd as it was never completed but is set in a fantastic city with much a more impressive neighbour in the shape of the Stadhuis. I also visited the Cloth-hall in Ypres when I was on a school trip to WWI battle sites, and surprisingly I remember it but not too much of the detail. In Wallonia the most impressive Belfry was the one at Tournai which is right next to the Cathedral, it has some excellent multi-lingual exhibits inside that explain the role of the Belfries very well, I also managed to catch a look at the one in Mons on the way to the Flint mines at Spiennes. Of the new ones added in France I have seen many from differing modes of transport and the one that sticks in my head is the one in Lille as it was big enough to make an impression from the Eurostar train. I did manage to stop and get a good look at the one in Calais lit up at night, which was surprisingly nice, as the city, to be polite, is not surprisingly nice! It is defiantly enjoyable to visit these cities and there is normally much more to see than just the Belfries. In this corner of Western Europe you also have some of its best food and in Belgium especially its best beers to make the experience all the more enjoyable. On Passports: "Inside of Passport version 2008 shows town halls of capitals"
Only portion of building inscribed: Some of the Belfries are inscribed separately from the larger structures of which they are a part. E.g Binche, Charleroi and Tuin. Location for a classic movie: Welcome to the Sticks (Bienvenue chez les Ch’tis, 2008) : one of the most famous scenes sees the hero playing "I Just Called to Say I Love You" on the carillon atop the Bergues belfry. 385 Community Members have visited.